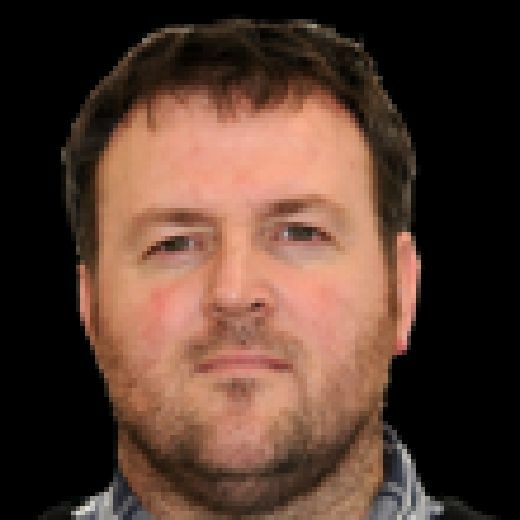 HULL PIRATES completed a memorable season in thrilling fashion after beating Peterborough Phantoms in overtime to win the NIHL Play-off title. Having already lifted the North One league championship and, last weekend, the North play-off title - denying Yorkshire rivals Sheffield Steeldogs on both occasions - Jason Hewitt's team carried their scintillating form through to Coventry's SkyDome Arena, seeing off Bracknell Bees 6-2 in the semi-finals before beating the Phantoms 5-4 with Bobby Chamberlain's breakaway strike at 62.15. "If you'd told me severn or eight months ago, or even longer than that when we were building this team, that we'd be sat here winning in Coventry, then I'd have taken it," said an understandably delighted Hewitt afterwards. "To do it the way we did it, was just amazing. It just shows the resilience of these guys, they just never give up. What a game it was, what a team Peterborough are too, to beat them in that fashion, I'm honestly over the moon." Hull came out of the blocks flying and got themselves 2-0 ahead inside six minutes, Sonny Karlsson getting on the board at 2.59 before Hewitt himself added a second at 5.26. But, as was to prove a running themse over the next 55 minutes or so, Slava Koulikov's Phantoms refused to go away and they were level by the end of the first period, halving the deficit in the 10th minute through Alex Padelek before Callum Buglass rounded Jonathan Kirk down the right wing and cut inside to lift the puck over Ashley Smith. Hull Pirates celebrate their NIHL Play-off final win over Peterborough. Picture courtesy of Hull Pirates. It was Chamberlain who showed plenty of experience when putting the Pirates ahead for a second time at 25.58, calmly side-stepping Jordan Marr to slot home after the Phantoms netminder had done well to save Lee Bonner's initial effort. But Peterborough more than held their own throughout the night and drew level again just under four minutes later when Glenn Billing forced the puck home. That was how it remained until the players came out for the third period which struggled initially to match the intensity of the first 40 minutes. But Hull got their noses in front for a third time at 50.31 when a Kirk shot was partially blocked only for the puck to fall kindly for Karlsson to rifle home his second of the night - the Swede no doubt forgetting about the pain he'd gone through earlier when he was forced to leave the ice part-way through the second after taking a puck to the face. Bobby Chamberlain scores the overtime winner for Hull to beat Peterborough. Picture courtesy of Hull Pirates. It wasn't enough, though, as Peterborough pushed hard once again, their pressure eventually telling at 54.19 when James Ferrara pounced to the left of the net from close range. 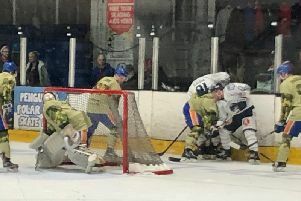 It eventually led to five minutes of 3-on-3 overtime with chances created at both ends, Smith in particular pulling off a couple of fine saves before the puck fell to Matty Davies, who broke down the left wing to find Chamberlain had kept pace with him and fed him an inch-perfect pass which saw him fire past a helpless Marr.